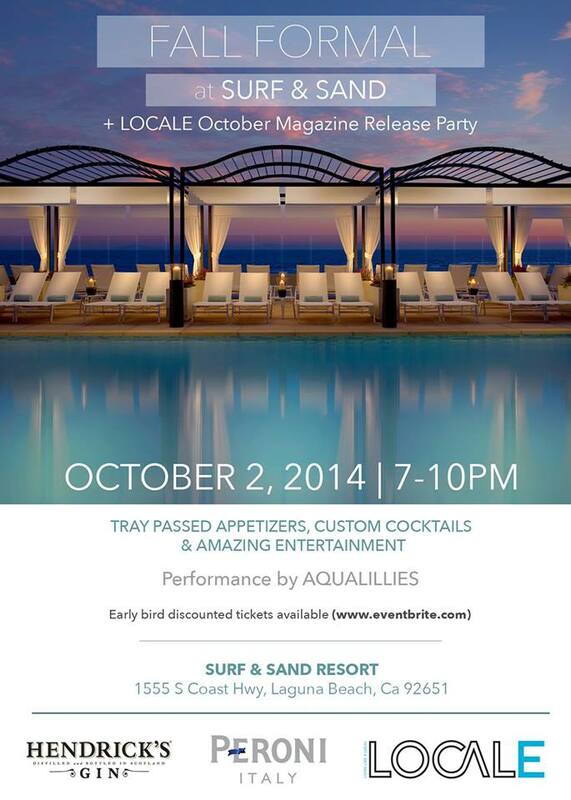 Come join Locale Magazine for the Fall Formal, the Issue Release Party at the gorgeous Surf & Sand Hotel overlooking the Ocean in Laguna Beach. An Elegant Affair..... Enjoy welcoming cocktails, scrumptious Hors d'oeuvres and classic Entertainment Poolside with the beautiful crowd. Dress in your finest gown, your best suit, leave the kids with a babysitter and enjoy one of the most beautiful views anywhere with a host of the area's elite. Only 150 Guests will attend this Special Event, get your Tickets before it sells out !!! You will be greeted by violins and handed a Hendrick's Gin cocktail as you watch the sky turn from dark orange to violet over the Pacific. You will be escorted down 5 levels to the Pool (or Bar) where you will be surrounded by sumptuous and soothing sounds while enjoying tray passed appetizers, custom cocktails and amazing entertainment. We do Publicity for Locale Magazine, and we have Special Price Tickets available - Single Tickets $45 with No Service Fees, and Couples Tickets $90 with No Service Fees. Normally these Tickets are $50 each plus $4 Fees, and Tickets will be $75 each at the door..... if available. All Tickets will be held at Will Call that evening - please bring your purchase receipt for Check-in. Our Special Price Ticket Sales end 4pm Thursday. Tickets will be $75 each at the Door.... if available. The best Dress-Up Party of the Fall, leading into the Holiday Season - Join all your friends for the Locale Magazine Fall Formal !!! Our Special Price Ticket Sales end 4pm Thursday. Tickets will be $75 each at the Door.... if available. Single Ticket $45 - No Service Fee !! Only 34 23 6 0 Tickets left !!! Two Tickets $90 - No Service Fee !! Click the Buy Now button to begin. We reserve the right to refuse or refund ticket sales if event is sold out or for any other reason.